Seemingly the entire extended royal family stepped out for an important event today: Prince Louis's christening. The youngest royal, who is a couple weeks shy of 3 months old, was accompanied by mum Kate Middleton, who wore Alexander McQueen for the occasion. Meanwhile, Kate's sister, Pippa, who is expecting her own child, looked impeccably chic in her latest maternity look. 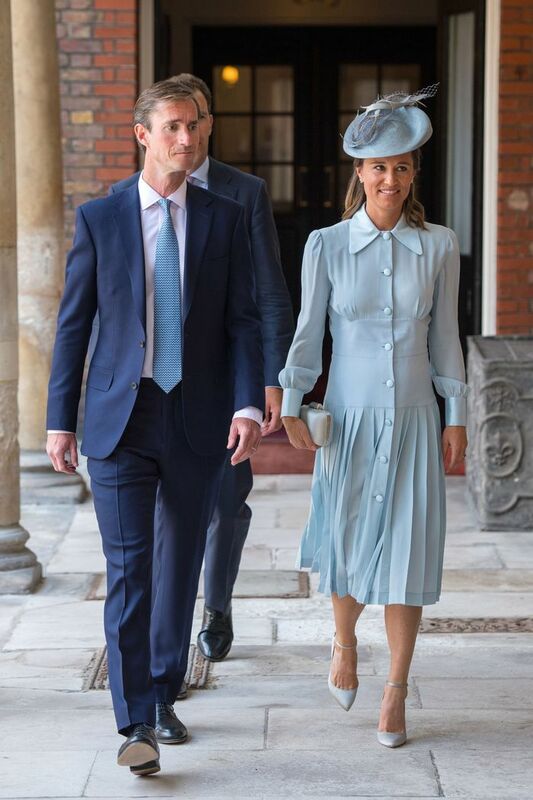 Pippa wore a custom baby blue Alessandra Rich outfit, which she complemented with a matching fascinator and pumps. When in doubt, it's never a bad idea to stick to one colour —it always looks chic (and is royalty-approved). Scroll down to see Pippa's new outfit and shop the baby blue trend. Next up, see how Meghan Markle also wore one colour head to toe.